The images of the new heavens, new earth, and new Jerusalem in Revelation chapters twenty-one and twenty-two are believed by many to represent man’s heavenly home or the eternal state upon a new material creation. A variation in Preterist circles has it that these images indicate man is somehow mystically in “heaven now.” However, the better view is that the new Jerusalem symbolically describes the covenantal habitation of the saints under the gospel of Jesus Christ, and the new heavens and earth the world beneath Jesus' righteous dominion. “His elect people will inherit the eternal estate in resurrected, physical bodies (Jno. 5:28-29; I Cor. 15:20-28) so that we might dwell in a material New Creation order (II Pet. 3:8-13." The assertion that man will live forever in physical bodies in a material “new creation” betrays a fundamental misunderstanding of God’s redemptive purpose. It is the stuff of Jehovah’s Witnesses other cultic sects inhabiting the fringes of Christendom. It stems from Gentry’s belief in Postmillennialism, which holds that God’s redemptive purpose culminates in a redeemed, material creation. Never mind the many statements in scripture plainly pointing to the fact that the saints inheritance is in heaven (Phil. 3:20; Col. 3:1-3; I Thess. 4:17; I Tim. 6:7; II Tim. 2:11; Heb. 11:13, 16; I Pet. 1:4), we are now to believe that our eternal state is upon earth; that having begun in the spirit, we are to be made perfect in the flesh! (Cf. Gal. 3:3) Discerning students will reject these literalistic approaches, opting instead for the view that John symbolically describes the present, legal and convenantal condition of the church under the New Testament, in which the saints are redeemed from sin, justified in law, and restored to the communion and presence of God. Perhaps the simplest way to demonstrate the proper interpretation of Revelation’s new heavens, new earth, and new Jerusalem, is to examine how Old Testament writers employed the imagery. Study of the prophets shows that three themes dominated their writings: 1) Prophecies of the coming captivity in Assyria and Babylon, 2) the restoration of Israel and Judah to their land, and 3) the coming Messiah. The method of the prophets was such that prophecies about the captivity and restoration were often couched in poetic language that defied fulfillment in those events, and looked instead unto Christ. So much so in fact that the captivity and restoration became types of events bound up in the coming Messiah, similar to the way Israel’s deliverance from Egypt and entrance into Canaan became types for God’s larger redemptive purpose, anticipating man’s inheritance in heaven. Thus, the destruction of Israel and Jerusalem by the Assyrians and Babylonians served as types of the coming destruction of Jerusalem in A.D. 70 by Rome, Josephus even reporting that the second temple was burned on the very day and month observed by the Jews to commemorate its burning by the Babylonians. Likewise, the return of the captivity was a type of mankind’s redemption and restoration in Christ. “Our adversaries have trodden down thy sanctuary…Thy holy cities are a wilderness, Zion is a wilderness, Jerusalem a desolation. Our holy and our beautiful house, where our fathers praised thee, is burned up with fire: and all our pleasant things are laid waste” (Isa. 63:18; 64:10, 11). The immediate application of this prophecy may have looked to the return from captivity, but the poetic nature of the language describing the new heaven and earth of restored Israel betrays the fact that the prophecy is pregnant with anticipation of the Messiah and looked beyond unto Jesus Christ. Indeed, a study of things prophesied about the Messiah and the return of the captivity from Babylon show that common language and metaphors are employed to describe both: Cities that were laid waste and desolate would be rebuilt; the wilderness would be like Eden, and the desert like a garden (Isa. 51:3), and blossom as the rose (Isa. 35:1); the Lord would open rivers in high places, and fountains in the midst of the valleys: the wilderness would be come a pool, and the dry places springs of waters (Isa. 41:18; cf 35:6, 7); the lame would leap like the hart and the tongue of the dumb would sing (Isa. 35:6); the wolf and the lamb would feed together and the lion eat straw like the bullock (Isa. 11:1-9; 65:25); the abundance of the Gentiles would be converted (Isa. 60:5), and all nations would flow together to worship the Lord in Zion (Isa. 2:1-5; 66:23). In this passage, Paul indicates that Mt. Sinai and old, earthly Jerusalem answered the old covenant, but that Mt. Zion and the heavenly Jerusalem answer to the new covenant. It is understood, of course, that the Jerusalem which “now is” must understood to refer to the writer’s time, not our own. Unbelieving Jews were persecuting the church, just as Ishmael had persecuted Isaac. 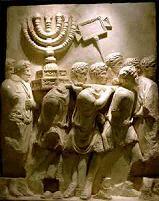 But the Jews would be cast out and their city and temple destroyed (Matt. 23, 24; Lk. 19:41-44; 23:27-31), and the new spiritual Jerusalem replace the old. The writer of Hebrews sets forth a similar dichotomy. The book of Hebrews was written during a crisis of the last days when Christian Jews were under persecution and pressured to forsake Christ and turn back to Judaism. The writer's main argument is to show that the law of Moses was merely provisional and the remnant of its outward trappings would shortly pass away. Christian Jews therefore should not be deceived into thinking they could find security or salvation in the temple cultus. Much to the contrary, the on-going temple cultus was an implicit denial of Christ's atoning sacrifice and sonship and marked the Jews as his enemies to be destroyed. The writer quotes the prophet Haggai and the "shaking" of the heavens and earth, signifying the removal of thrones and dominions dominating the pre-Christian world (Heb. 12:26-28; Hag. 2:6, 7, 21, 22). Twice the writer mentions a "world to come" in connection with the dawning kingdom and dominion of Christ that would replace the world framed by the Gentile world-powers, including unbelieving Jews (Heb. 2:5; 6:5). The writer also makes equally plain that Zion and new Jerusalem are the new covenant. Here, the writer compares the tangible nature of things pertaining to the old covenant to the intangible things of the new, indicating the superiority of the latter. Notice that the new covenant answers to Zion and the new, heavenly Jerusalem, and these in turn to the church and the spirits of just men made perfect (cleansed from sin) by sprinkling with Christ’s blood. This is why John, in Revelation, describes the new Jerusalem as the bride of Christ; viz., the new Jerusalem is Christ’s church under the New Testament, just as Israel had been God's bride under the Old Testament (Jer. 2:2, 3; Ezek. 16:6-8; Rev. 21:2, 9). The discussion above demonstrates the substance of the new heavens and earth, and shows that it answers the world-dominion of Christ. What about the timing? When would these things come to be? Stephen, when tried for preaching Christ would come and destroy the city and temple and change the customs embodied in the Mosaic law (Acts 7:13, 14), cited the sixty-sixth chapter of Isaiah as proof that he was preaching nothing that had not been prophesied long before. Before the Sanhedrin he quotes Isaiah, saying, “Heaven is my throne, and earth is my footstool: what house will ye build me? saith the Lord: or what is the place of my rest? Hath not my hand made all these things?” (Acts 7:49, 50; cf. Isa. 66:1, 2). Stephen thus indicated the imminent fulfillment of Isaiah’s prophecy. The timing of the new heavens and earth, therefore is not left in doubt, but was clearly tied to the destruction of Jerusalem in A.D. 70. We need only peruse the rest of Isaiah’s prophecy to see that this is so. “All flesh” is equivalent to “every creature” and “all nations” of the Great Commission (Matt. 28:18-20; Mk. 16:15, 16). “Worshipping before the Lord” points to the assimilation of the Gentiles into the kingdom (church). The carcasses of those eaten of fire and worms has in view the bodies of the Jews who perished in the ravages of war, famine, and pestilence during the siege. Josephus reports that eleven-hundred-thousand Jews were slain in the siege of Jerusalem. These were cast out of the city into the valley of Hinnom during the siege, where they lay swollen and putrefied, eaten of fire, maggots, and worms. The testimony of Stephen, Christ, and Isaiah thus combine to make clear that the new Jerusalem would follow the destruction of the old, earthly Jerusalem in A.D. 70. At the beginning of this article we indicated that, given the fulfilled nature of biblical eschatology, some Preterists feel they were somehow mystically in “heaven now.” Is there any validity to this interpretation? These passages make plain that there was a place Paul desired to go; there is not the least indication that he in any sense felt he had already gone to it or that it had, or ever would, come to him. The essential barrier to enjoyment of that place was his fleshly body. Not until the body was put off in death could his hope be realized. Is there a sense in which saints this side of eternity share in that heavenly kingdom? Yes, indeed there is. The new covenant is a legal arrangement between two parties: God on the one side and ransomed sinners on the other. Under the new covenant, those who obey the gospel by repentance and baptism are acquitted from sin and made sons of God through Christ. As sons, we have citizenship and inheritance in heaven (Eph. 2:19; Col. 3:20). We have been translated in contemplation of law from the dominion of sin to the kingdom of God’s dear son (Col. 1:13). We enjoy the legal benefits of adoption and sonship now and are presented legally justified before the throne by and through the agency of Christ (Eph. 2:5, 6; cf. Heb. 9:24). If we recall the erection of the tabernacle in the wilderness and how God's glory filled the tabernacle, signifying his dwelling among his people, that pretty much sums up the meaning of the imagery of Rev. 21, 22: The church is the tabernacle and God dwells with man through it. However, we are not actually in heaven, nor has heaven come down to earth. The whole arrangement is legal and contractual, awaiting ultimate fulfillment at the body’s death. The new Jerusalem describes the covenantal habitation of the saints, the New Testament church. A. Plummer, The Revelation of St. John the Divine, Pulpit Commentary (Hendrickson, Peabody, MS), Vol. XXII, p. 509. It comes down out of heaven, not because it was first “raptured” there, but because the New Testament originates with God; he is the architect of our salvation; the saints, though on earth, have citizenship in heaven. Irenaeus, Against Heresies, V, xxxvi, 1, 2; Ante-Nicene Fathers, Vol. I, p. 567. Tertullian, Against Marcion, III, xxv; Ante-Nicene Fathers, Vol. III, p. 342. Kenneth L. Gentry Jr., Christ's Resurrection and Ours, (Chalcedon, April 2003). Josephus, Wars, VI, iv, 5, 8. Josephus, Wars of the Jews, VI, ix, 3. This figure does not include those who perished in foreign cities or died in battles throughout the rest of Judah and Galilee. Josephus, Wars of the Jews, V, xii, 3, 4.